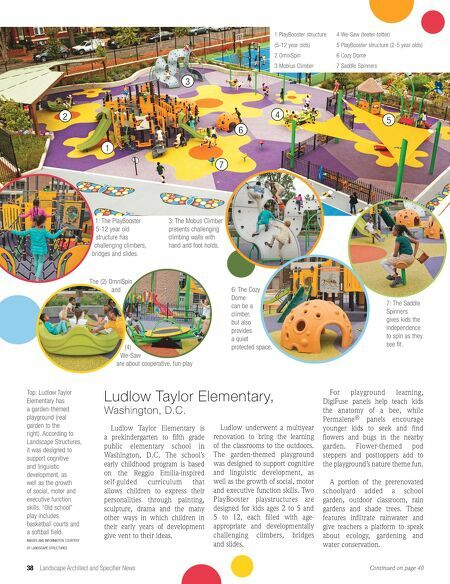 38 Landscape Architect and Specifier News Continued on page 40 Ludlow Taylor Elementary is a prekindergarten to fifth grade public elementary school in Washington, D.C. The school's early childhood program is based on the Reggio Emilia-inspired self-guided curriculum that allows children to express their personalities through painting, sculpture, drama and the many other ways in which children in their early years of development give vent to their ideas. Ludlow underwent a multiyear renovation to bring the learning of the classrooms to the outdoors. The garden-themed playground was designed to support cognitive and linguistic development, as well as the growth of social, motor and executive function skills. Two PlayBooster playstructures are designed for kids ages 2 to 5 and 5 to 12, each filled with age- appropriate and developmentally challenging climbers, bridges and slides. For playground learning, DigiFuse panels help teach kids the anatomy of a bee, while Permalene ® panels encourage younger kids to seek and find flowers and bugs in the nearby garden. Flower-themed pod steppers and posttoppers add to the playground's nature theme fun. A portion of the prerenovated schoolyard added a school garden, outdoor classroom, rain gardens and shade trees. These features infiltrate rainwater and give teachers a platform to speak about ecology, gardening and water conservation. Top: Ludlow Taylor Elementary has a garden-themed playground (real garden to the right). According to Landscape Structures, it was designed to support cognitive and linguistic development, as well as the growth of social, motor and executive function skills. "Old school" play includes basketball courts and a softball field. IMAGES AND INFORMATION COURTESY OF LANDSCAPE STRUCTURES 3: The Mobus Climber presents challenging climbing walls with hand and foot holds. 6: The Cozy Dome can be a climber, but also provides a quiet protected space. 7: The Saddle Spinners gives kids the independence to spin as they see fit. 1: The PlayBooster 5-12 year old structure has challenging climbers, bridges and slides. The (2) OmniSpin and (4) We-Saw are about cooperative, fun play 1 PlayBooster structure (5-12 year olds) 2 OmniSpin 3 Mobius Climber 4 We-Saw (teeter-totter) 5 PlayBooster structure (2-5 year olds) 6 Cozy Dome 7 Saddle Spinners 1 2 3 4 5 6 7 Ludlow Taylor Elementary, Washington, D.C.